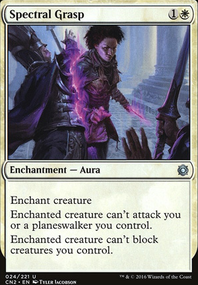 At the end of your turn, target opponent gains control of Jinxed Choker and puts a charge counter on it. At the beginning of your upkeep, Jinxed Choker deals damage to you equal to the number of charge counters on it. (3): Put a charge counter on Jinxed Choker or remove one from it. Thanks for mentioning that, though. For some reason half of my deck was goofed up with an accidental category. And also, thanks for the suggestons, Sivvi's Valor is a neat one-time thing and could be useful. Jade Monolith works similarly but is of course telegraphed to the rest of the table. I would probably add in a more symmetrical effect like Angel's Trumpet or Dingus Staff before Jinxed Choker . It does grow on its own which is nice, but I'm not sure how useful it would prove. Dealing 2-3 damage on an opponent's upkeep isn't a strong use of a card slot, since I find it unlikely that the choker would be passed back to me with Darien on the board. I just decided to pick up my plans for a Darien deck that have sitting for about a year, and this looks like a great list. Sivvi's Valor is a gem of a find. You might like Jinxed Choker for the masochism. I had a question about how you pulled off some of your formatting. In your custom categories, you're able to have many of your cards show up in more than one category; but when category is type, each card in the deck has only one copy. I tried to do that in my own lists a few years back but it didn't work (with a format like '1x CardName #Category1 #Category2' in the deck entry, it would only show up in Category 1) and TappedOut said that they didn't know how to solve it. What sort of workaround did you find, or did the site figure it out while I wasn't looking? Jinxed Choker might be interesting as it has the potential to help you draw cards when its not your turn and is kinda funny. Soulus101 on Why are you hitting yourself? Thanks lithium142. The key token generator is of course Darien himself, and the rest of the deck revolves around ways to beat yourself up to generate tokens, and then getting value out of them, and generally being annoying, by making opponents make bad choices, and a bit staxxy. Jinxed Choker was almost too good when I played it out, because as soon as Darien hit the board my opponents were conspiring to pass it between each other, and it escalates so quickly in multiplayer! Green is out of the question, as The King of Kjeldor is the inspiration and key; I'd essentially be building a completely different deck if I switched to Trostani et Al, which may be powerful but isn't the point (I'm well acquainted with Aura Shards! Hence all of the enchantment removal). Darksteel Mutation is definitely one I am still considering. It's only out because I neglected to consider it for the initial build, but have been beating myself up (pun intended) ever since. I'll consider your spot removal suggestions, as I agree, it is a bit low. In general I think that I have enough threats to weather a few wipes, so if Divine Visitation goes, there's still Cathars' Crusade. I'm also generally underpowered relative to my opponents, so their stuff goes before mine more often than not. And of course, there are the infinite combos to let me win from nowhere. If I had the cash to splash, I'd be keen to attempt a Balancing Act + Teferi's Protection combo... Sacrifice ALL the permanents! I dislike tutors in EDH (I play for lols, not wins), so I'm happy with the power level:price ratio at the moment. That said, thanks for your interest and suggestions! Jinxed Choker, does not look like a threat at first but when it gets around 8-10 counters people start to worry. Mask of Memory can draw you a lot of cards + if you have Land Tax, it can turn lands into pure gas. Secure the Wastes can win you the game out of nowhere. Luminarch Ascension is a power house and puts your oppenents in a strange spot with Darien out, "to attack or not to attack". 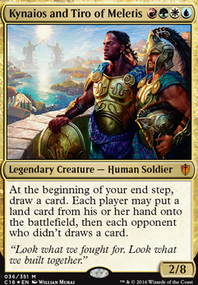 Oketra the True is a very good plan B commander when Darien is either removed or not working. Hour of Revelation is a must. 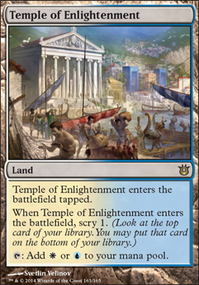 Buried Ruin, Isolated Watchtower, Scavenger Grounds and Shefet Dunes are some great utility lands, worth trying. I've played my paper Darien deck for a year, at my local store an in my playgroups. He is too much fun! Politics on Rakdos is usually more about threatening with The Sword than offering The Olive Branch. There's Oath of Ghouls although you'll have very little control of it. You could also try Assault Suit, Brawl, Eye of Doom, Humble Defector, Jinxed Choker, and Stuffy Doll. I really like the use of Oppression here. Geth's Grimoire might be a powerhouse for you, especially if you include Words of Waste to go with it. I tend to play decks that play the player and tend to flow in a more asymmetrical way to the game; so I like to use cards such as Altar of the Brood and Mindcrank as a form of pre-removal. Using red, you have access to many of the overlooked cards in the mental game of magic. Avarice Totem, Custody Battle and Fractured Loyalty can become game changers in and of themselves. Avarice Totem with Pithing Needle can be quite fun. I think that Jinxed Choker deserves a spot here, and that you could consider some additional hidden gems such as Vampiric Spirit or Basilisk Collar in here with some of your "passive pingers" such as Harsh Mentor, Xantcha, Sleeper Agent or even Sleeper Agent herself, etc. Some other great options would be cards that encourage your opponents to make bad decisions - I usually try to not beat the deck but the opponent in magic, so cards such as Pain's Reward and Choice of Damnations can be a house depending on how well you play the game and the opponent. I would always include a Glacial Chasm with a way to fetch it. I would confuse your opponent by being friendly with some cards such as Abyssal Persecutor and cards of the like. You're not trying to help the other players win, you're owning your opponents without them realizing it. You have access to political time bombs such as Impending Disaster being in Red. Since you're already running the Planar Void, might as well throw in the Helm of Obedience win to go with it. Since we're in black, Priest of Yawgmoth with Spine of Ish Sah seems great. That might spark some interest in sacking things. You will have access to Goblin Welder... so there's that. Maybe stealing equipment would be a thing you'd enjoy... you know there's always "that guy" that runs "those cards" all the time... Red is all about that. 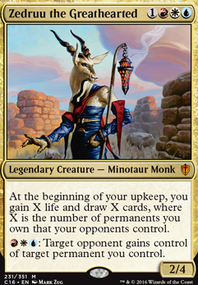 Another idea: Mox Monkey: Gorilla Shaman with a Mycosynth Lattice seems really fun. 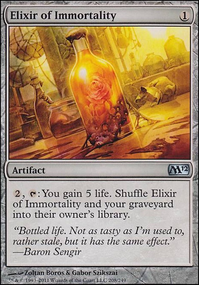 Or... Electrickery + Kormus Bell + Urborg, Tomb of Yawgmoth would be fun. If you're feeling aggro-y, Filth + Urborg, Tomb of Yawgmoth seem strong. Maybe you could include a Wish Board with Burning Wish or Death Wish... in fact, you could keep the weird political theme going with a suicide life swap build with that black tree: Tree of Perdition and/or Soul Conduit. Very cool start here and again, I hope all of this is helpful to you!